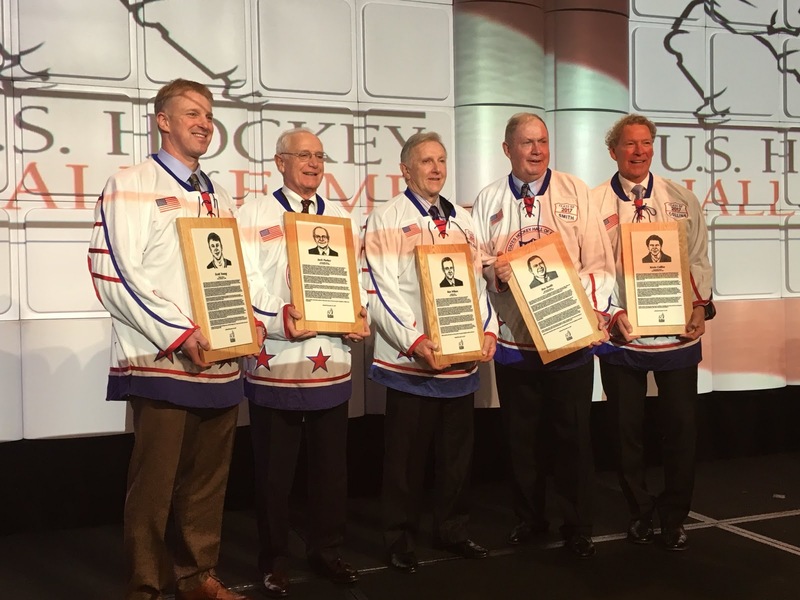 A trio of Terriers—legendary head coach Jack Parker, assistant coach and U.S. Women’s Olympic coach Ben Smith and former Terrier standout and assistant coach Scott Young—were inducted into the U.S. Hockey Hall of Fame last night in ceremonies at the Westin Boston Waterfront Hotel. The 2017 class also included Ron Wilson, the winningest American NHL head coach and 28-year NHL referee Kevin Collins. 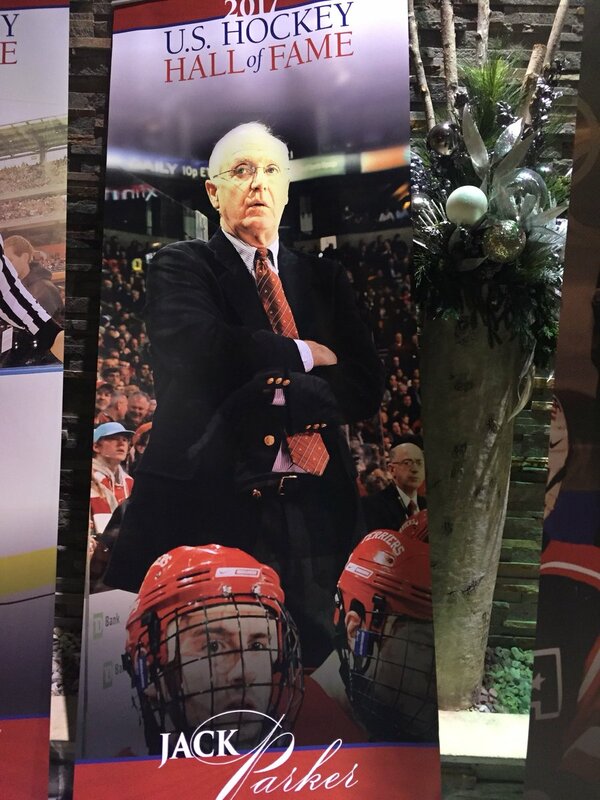 During his 40-year tenure behind the Terrier bench, Parker directed 897 wins—third best among D1 coaches—three NCAA titles, 11 conference championships and 21 Beanpot titles. Smith was Parker’s assistant for nine seasons before going on to be head coach at Dartmouth and Northeastern as well as lead the U.S. Women to Olympic gold in 1998. Young skated for BU for two seasons, then embarked on a 17-season NHL career, winning the Stanley Cup twice and ranking #15 in games played by Americans and #20 in points. After two seasons as a BU assistant, he became the Penguins Director of Player Development, reunited with BU teammate Mike Sullivan. The three join 10 previous Terrier inductees, including Jack Kelley, Chris Drury, Keith Tkachuk and 1980 U.S. Olympic gold medal team members Mike Eruzione, Jim Craig, Jack O’Callahan and David Silk. 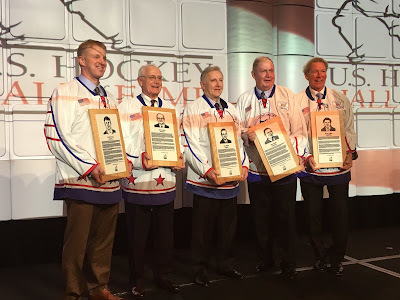 #FunFact @TerrierHockey’s Scott Young played for all 3 coaches being inducted into the USHHOF with him tonight: Jack Parker and Ben Smith at BU and Ron Wilson for Team USA. ► With 18 points (5G, 13A) in 19 games, sophomore Chad Krys is third in scoring among Division 1 defensemen. USA Hockey opens its Junior National Team camp today to select the 23-man squad for the 2018 IIHF World Junior Championships. 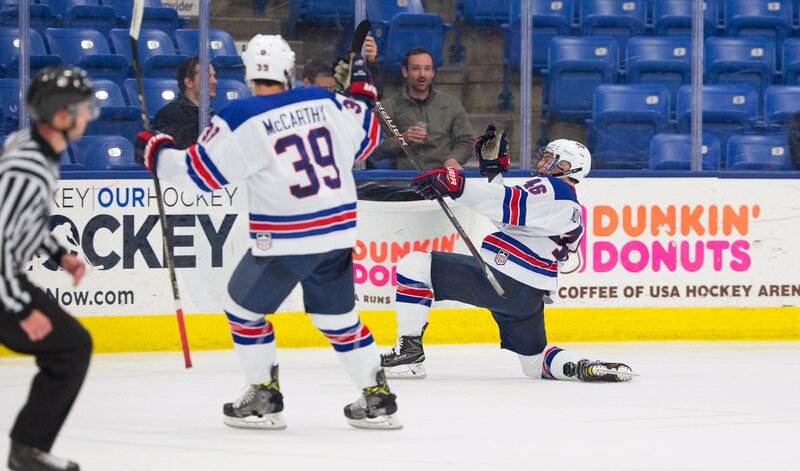 The current 26 man roster includes BU sophomores Jake Oettinger and Patrick Harper—both returnees from the 2017 gold-medal team—and freshman Brady Tkachuk. TSN’s Craig Button, previewing Team Canada, offer his thoughts on Terrier sophomore Dante Fabbro (video). 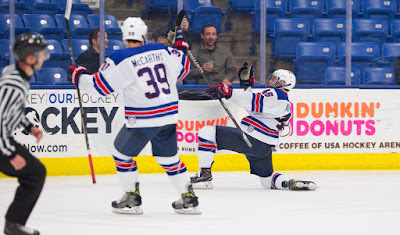 2019 recruits Trevor Zegras and Case McCarthy scored goals for Team USA in a 12-0 blowout of Slovakia at the U17 Four Nations Tournament in Veliky Novgorod, Russia. Zegras converted a pass from fellow BU recruit Alex Vlasic in the second period, while blueliner McCarthy scored in the third period. Zegras, who scored 42 points for Avon Old Farms last season, added a pair of assists. Team USA next plays Switzerland on Friday. HockeyProspects.com has ranked 2020 recruits Dylan Peterson and Donovan Sebrango #1 and #2 among 2018 OHL draft prospects from the Ottawa-region HEO Midget AAA league. 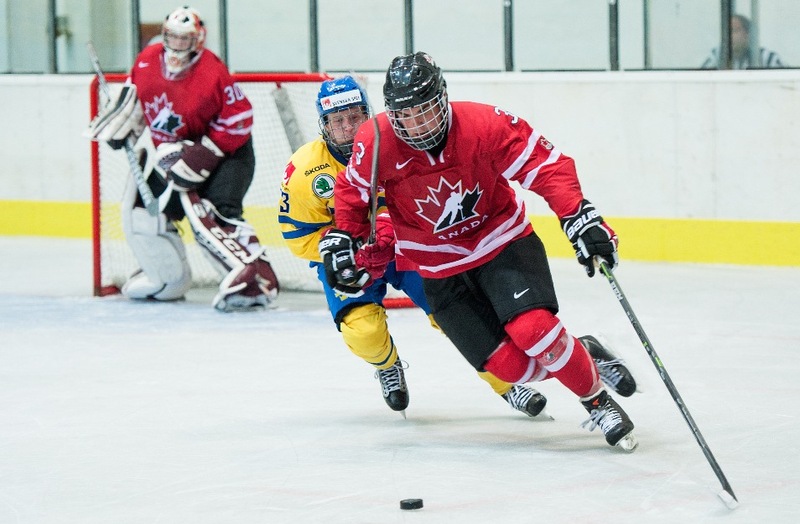 Leading the way in the Ottawa Region in our first ranking is 6’3" winger Dylan Peterson of CIH Academy White. Peterson has a complete package with pro potential. Dylan skates well and possesses high-end skill, developing a physical edge has also added another element to his game. Following closely behind Peterson is his teammate Donovan Sebrango. Donovan is left shot defender with outstanding two-way traits to his game. Sebrango consistently shows strong vision and above average puck moving skills. AJ Greer scored his fifth goal for San Antonio and David Warsofsky contributed an assist, but the Rampage fell in overtime, 3-2, to Ontario. ►TheHockeyWriters.com evaluate the Bruins top prospects, including Jakob Forsbacka Karlsson. Former BU co-captain John McCarthy scored a goal and an assist in the Barracuda’s 5-2 win against Tucson. Former Terrier Rebecca Russo and the Metropolitan Riveters of the NWHL are off to a 6-0-0 start.